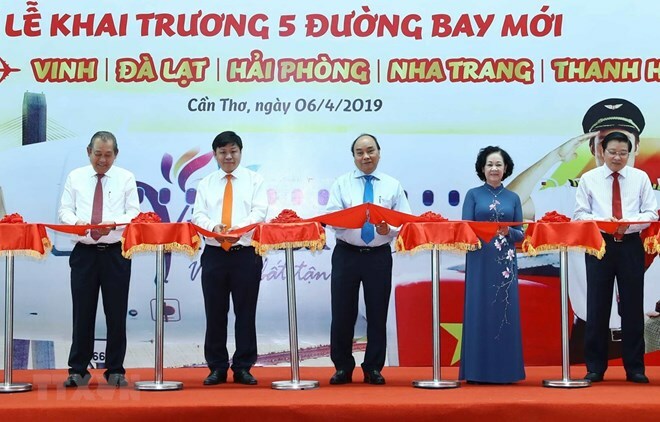 Can Tho (VNA) – Prime Minister Nguyen Xuan Phuc attended a ceremony in the Mekong Delta city of Can Tho on April 6 to launch five domestic air routes by the low-cost carrier Vietjet Air. Speaking at the ceremony, PM Phuc described the opening of the new routes as contributing to the building and developing of the region, blessed with abundant potential but still difficult in transport. He also praises the fledgling Vietjet Air as a fast developing airline with a modern fleet and high-quality services. The leader also ordered the Ministry of Transport to quickly take measures to improve the quality and safety of the flights, and to upgrade Vietnam’s airport system so as to meet the requirements of the new context.